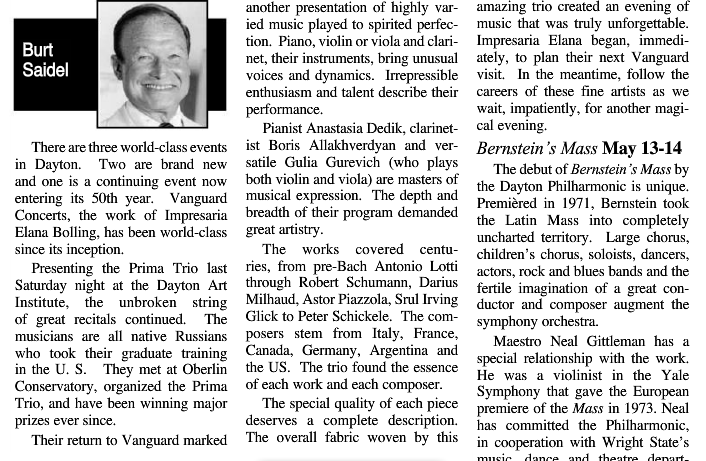 "Concertgoers were treated to a remarkable performance on Monday, January 25, at Watertown High School Auditorium. Prima Trio, a group of talented young performers, entertained the audience with classical music. The trio possesses the amazing ability to flawlessly layer the music of the piano, violin and clarinet. The musicians performed primarily lighthearted classical chamber music that featured music by Mozart up through 20th century classical composers. Their enthusiasm and passion for their music was evident throughout the entire performance..."
"...the group's performance was outstanding. The clarinet presented jazzy riffs, the violin became a country fiddle, and the piano recalled Jerry Lee Lewis. All that was combined with such demanding ensemble passages that made one long to hear the Prima bring in a cello for a performance of Messiaen's Quartet for the End of Time. The encore was one of Astor Piazzolla's Four Seasons for Porteños (a Porteño is an inhabitant of the port city Buenos Aires), which was delivered with appropriate Argentine passion."